Bull thistle (Cirsium vulgare) is native to Northern Africa, Asia, and Europe. It is thought to have been introduced into North America by European settlers, possibly as a seed contaminant, in the early 1800s. It is now present in every state in the U.S. and every county in Minnesota. 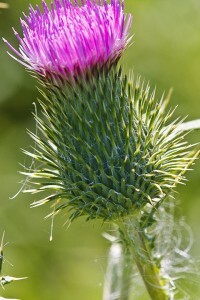 It is a prohibited weed seed in Minnesota but it is not considered as serious a threat as other invasive thistles. The spiny foliage makes it unpalatable to wildlife and livestock. It reproduces by seed only, not vegetatively. About 95% of the seeds germinate but few plants survive to maturity. Seeds that do not germinate in the first spring do not survive the following winter unless they are buried. Seeds that are buried at least 5 inches, as in cropland under cultivation, remain viable for only 3 years. This species is identified by the distinctive three dimensional appearance of the rosette leaves; the spiny wings on the stem that are continuous nearly to the leaf below; the leaves that are cut more than half way to the midrib; the few large flower heads; and the phyllaries that are long tapered and curve outward. Other thistles in Minnesota share one or two of the latter three characteristics, but none share all three. This entry was posted in Plants and tagged bull thistle, Cirsium vulgare on December 16, 2014 by John Valo. Crown vetch (Securigera varia), native to Western Asia and Europe, was introduced into North America in 1869. It is now found in every state except Alaska. It has been planted extensively since the 1950s on highway embankments in the upper two thirds of the United States to prevent erosion. The practice is now discouraged because its dense colonies often hide rather then prevent soil erosion. It has been used since the 1970s to revegetate abandoned mining sites. It has been and still is planted in gardens as an ornamental. It readily escapes cultivation. Once established, it takes a combination of methods and several years to eradicate. When in flower there is no similar species. In its vegetative state it appears similar to species in the Vicia and Lathyrus genera. Securigera is distinguished by the absence of tendrils; a terminal leaflet; an umbrella-like inflorescence; and fruits that break into one-seeded segments at maturity. Crown vetch is the only species of Securigera that is found in Minnesota. This entry was posted in Plants and tagged Coronilla varia, Crown vetch, Securigera varia on December 10, 2014 by John Valo. Blue vervain (Verbena hastata) is common throughout Minnesota, possibly occurring in every county in the state. 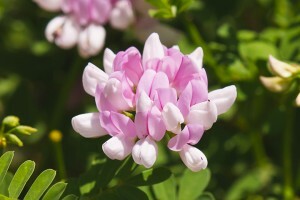 It blooms from July to September in marshes, meadows, fields, swamps, and roadside ditches. The densely crowded flower spikes bloom from the bottom up and only one to a few complete rotations of the spiral are in bloom at any one time. Blue vervain is distinguished from hoary vervain by its green (not grayish-green) foliage; long, narrow, noticeably stalked leaves that are inconspicuously short hairy; inflorescence of 5 to many spikes; and distinctly pointed flower spikes. 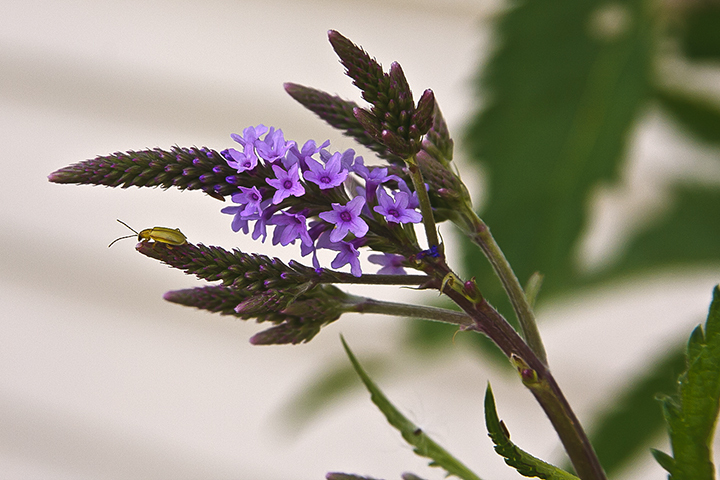 There are two varieties of blue vervain, both of which occur in Minnesota. This variety (var. hastata) is distinguished by the presence of one or two lobes at the base of the larger leaves. This entry was posted in Plants and tagged Blue vervain, Verbena hastata var. hastata on December 3, 2014 by John Valo. The hibernal ecological season corresponds to the winter calendar season. In our area it is characterized by cold temperatures, a usually snow-covered landscape, and an absence of migratory bird species. Deciduous trees are bare and fallen leaves begin to decay. Migrating birds have settled in winter habitats. 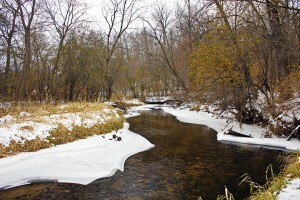 In Minnesota the hibernal season usually begins about December 1 and lasts until about March 1. The average date for the first one-inch snow fall in the Twin Cities is November 18. The average date for “permanent snow cover” in the Twin Cities is unknown but is probably mid-December. Permanent snow cover here is defined as at least one centimeter of snow cover that lasts at least one month. On November 10, 2014, Minnesota was hit with its first major snow storm leaving a snow cover that has persisted and will probably be with us until at least December 10. On average, cold temperatures arrive in the Twin Cities on December 3. On that date the average high temperature is below freezing. 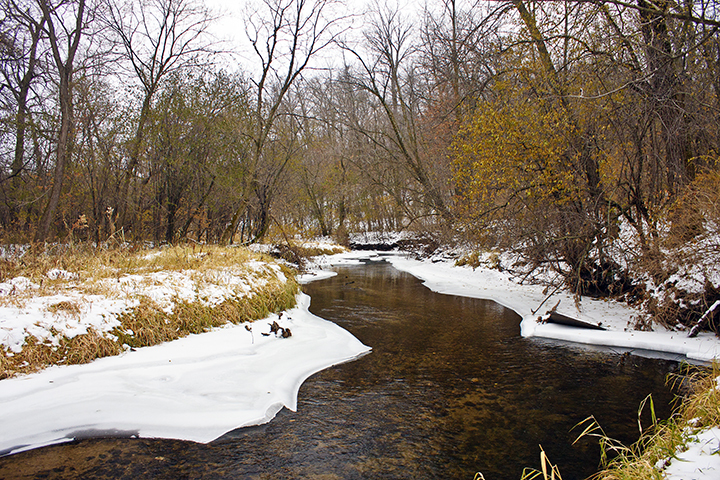 The first stretch of cold weather arrived with the November 10 snowfall. The unscientific term “stretch of cold weather” here is defined as a week with more daily high temperatures below freezing than above. Between November 11 and November 20 the temperature (in Lakeville) did not rise above 24°. This year the winter calendar season will begin on Sunday, December 21, at 5:03 p.m. CST. By that time the hibernal season, whether determined by snow cover or by daily temperature, will have been with us in the metro area of Minnesota for six weeks. This entry was posted in Seasons and tagged Hibernal Season, Savage Fen SNA, Winter on December 3, 2014 by John Valo.